The WEAPON-X BOOST FREEZE CHILLER IS AVAILABLE NOW! In this tech article, you will read how this heat soaked ZL1 struggled to make over 630 WHEEL HP until the addition of our Boost Freeze Chiller! You will see at the end, that we were able to get an extra 4* of timing into this setup, lowered the boost by 1.5 PSI simply due to the cold compressed air, and the car pounded down nearly 690 WHEEL HP with just our WXM stage 1 carbon intake, WXM ported supercharger, Nick Williams 103mm Throttle Body, and our WXM Griptec 15% pulley, and Kooks headers! Simply put, the LT4 engines are amazing and respond very well to throwing more boost at them, but with more boost comes more heat. As a supercharger compresses air, the byproduct is heat. Couple this with the hot engine heat the supercharger picks up via conduction, the radiant heat coming off of the headers, and convection of hot air blowing around the engine bay, and you have the perfect storm for making, well... less power. Most LT4 owners are under the assumption that the stock heat exchangers are OK for basic mods, but as you will see, they're not even really sufficient for the stock setup as we frequently see knock on stock LT4 cars when pulled in their 1:1 gear. The way to make MORE POWER is to fight this heat and keep the temps going into the cylinders manageable so we can advance the timing and make that nice broad power band. Unlike previous LS cars, the IAT2 is a worthless PID on the Gen 5 LT engines, because the timing/spark table is based on "Manifold Air Temp" [MAT] , which is a calculated algorithm that is barely affected by anything, even upgraded heat exchangers. 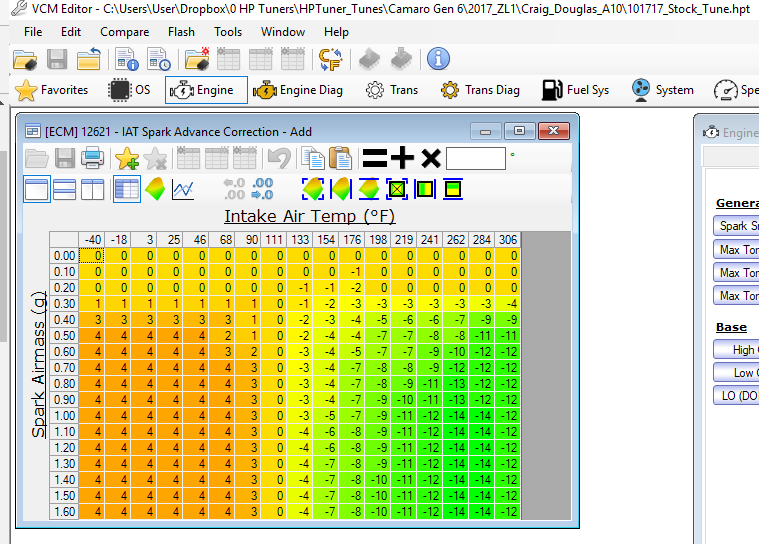 IAT2 is valuable to show you what the air temps actually are coming out of the intercooler bricks, but that is only 1 part of the equation for allowable spark resulting in power. The MAT is a combined calculation referencing ECT, IAT1, IAT2, and ambient air if I recall, but there isn't a way to tune the calculation in your favor. I have been after HPT for years for more help on this without much response. The map is editable and that is the table I showed you first yesterday; however, as you can see in the 5 log post after the baseline, that just because it's calculated, doesn't mean it's bad, although I would like a more definable table. Regardless, you can see in that 5 log post that we did clear out the IAT reducer in the 133* temp bracket and still saw a lot of knock. The IAT2 values are very low compared to previous LS cars, so the intercoolers in these superchargers are more efficient; however, it also appears that the DI engines are more susceptible to knock at lower "IAT2"s, likely due to the compression and higher boost than the LS cars. So, widening the IAT reducer table just allowed a lot more knock, it didn't help much even at the 9% level without increased cooling as you could see above by the 5 logs. Also, unlike the LS cars, the LT cars AC will stay on during a pull as it just destrokes the compressor so you do feel a little less output in the cabin for example, but it's still working and kicks up as soon as you let off the throttle. This destroking helps us out considerably and you can somewhat tune the AC system which is where we are now. We are going to do some fatigue tests to destroke the compressor less to see if it fails on my car, but for now, all results are as is. Even testing on another 875whp Whipple LT4 car, we were only seeing a 2% difference in power on a cold pull, and in hot pulls, the chiller just buried the heat soaked MATs as you will see below! As you'll see in the following logs, the IAT2s NEVER get over 120*, but as you will see the IAT spark is pulling timing, because it's based on Manifold Air Temp, not IAT2. Ask ANY gen 5 tuner how long it takes those MAT temps to come back down to even a reasonable temperature , it's a half hour or so and back to starting point is about an hour. To see those temps drop down from 140* to under 120* in just minutes is absolutely astonishing! 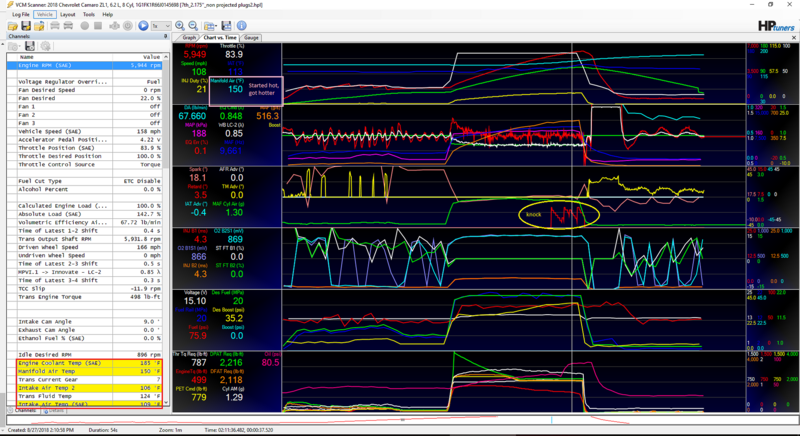 On a stock ZL1 (sans the NX lid and our no-tune intake) looking at logs you will see. With the stock pulley which is making just under 11 PSI of boost, the MAT on a hot day normally start over 130* and STAY over 130*, oh and you're pulling -3 to -4 of spark/timing at 133*. MAT 132* - yes ECT, IAT1 and IAT2 are going up, and MAT went down?!!! MAT 139* and as you can see by this graph, you're losing -2* of timing and that is with the IAT2s just 8* over IAT1s and that MAT line continues to rise us the log stops and will soar to over 160*! 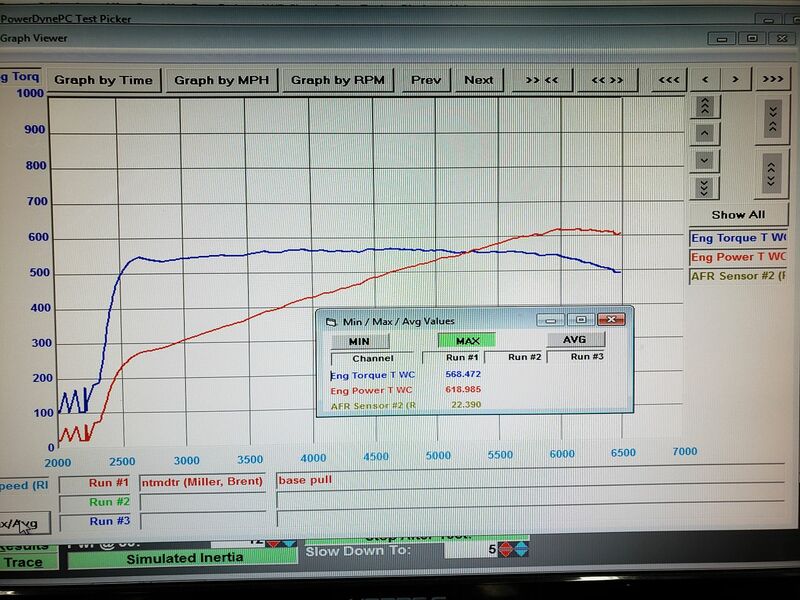 You can see there are tickles of knock [KR] as high as 2* over 5700 RPMs and we see this frequently on the long pull of a loaded dyno on a stock LT4 car. The RED boxed highlighted air temps are the values referenced above. 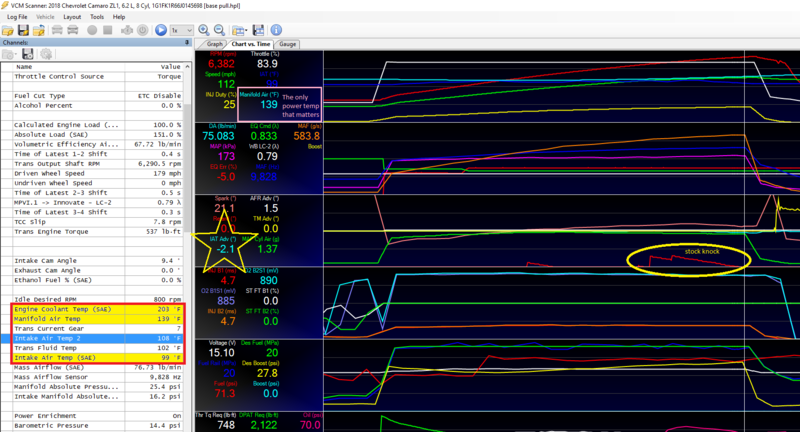 The YELLOW star shows the 2* being pulled on the STOCK calibration for IAT, yet the IAT2 value only shows 108*. The PINK box around the Manifold Air Temp (MAT) which is what the IAT Spark Table references. 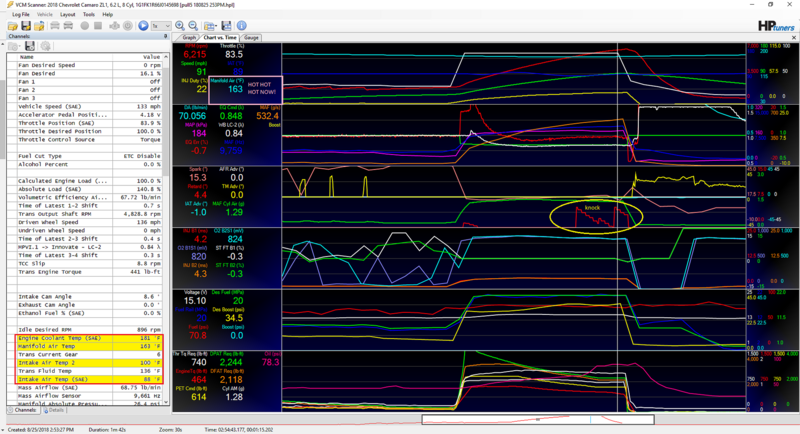 The YELLOW Bubble shows the knock aka KR on the STOCK calibration. Next, you will see how this ZL1 responds as we add a common 2.3 upper pulley which is a 9% increase on the supercharger. Most guys think this will result in great power gains without much heat, but we even were tuning in 6th (10 speed car) vs 7th so the pulls were shorter and we still saw lots of knock and terrible Manifold Air Temps after the first pull! Now I want you guys to see just HOW HOT the temps get and stay!!! 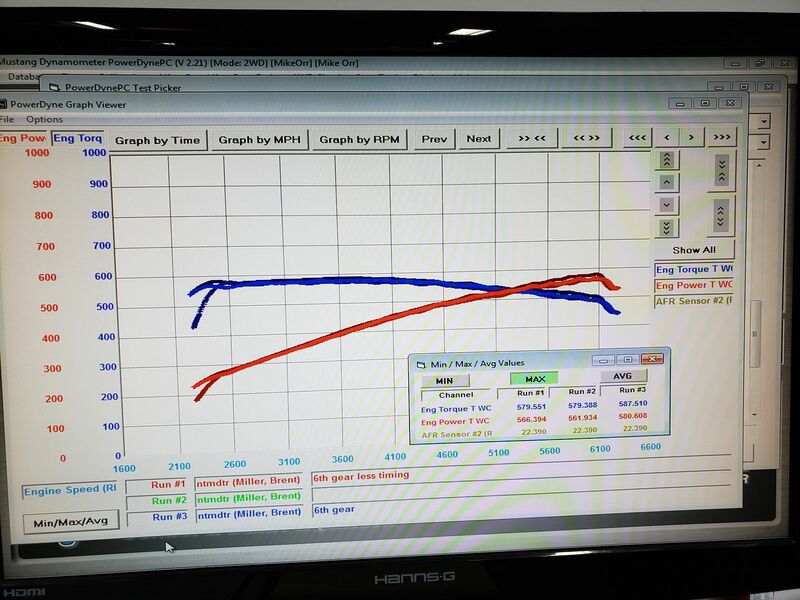 Here are 5 dyno pulls, all with the same combo approx 33 minutes apart start to finish, around 8-10m between each pull and while it's not a legit comparison to a car on the track with heat entering on the straights and coming out of the turns and cooling off between with the fans on blast. On this ZL1 looking at logs, you will see. With the 2.3 upper pulley making nearly 13 PSI of boost, the MAT on a hot day normally start over 130* and STAY over 130*, but since it's been tuned, we removed the IAT spark pull from the 133* column, so the next threshold is 154*. 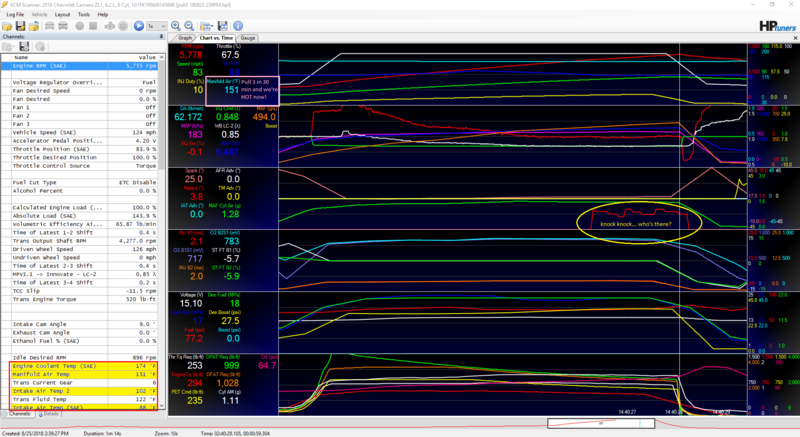 The YELLOW Bubble shows the knock aka KR on the modified calibration. Dyno Pul #2 at 2:29PM - the car sat on the dyno with the fans on it and the entire system was heat soaked in 9 minutes shut off and the MAT was already NOT happy, despite the Engine coolant, IAT1, and IAT2 being reasonable, and remember MAT is what our power is based on. Dyno Pul #3 at 2:39PM - the car sat on the dyno with the fans on it and the entire system was even MORE heat soaked in another 10 minutes after just a NINE SECOND PULL and the MAT was pissed off now LOL, despite the Engine coolant, IAT1, and IAT2 ALL still being reasonable, and don't forget again, the MAT aka Manifold Air Temp is what our power is based on. MAT 151* and up to 157* just 14 seconds later as the car is winding down on the rollers before the log stops. Just think of how hot the system gets when you're on and off the throttle on a real world road course. 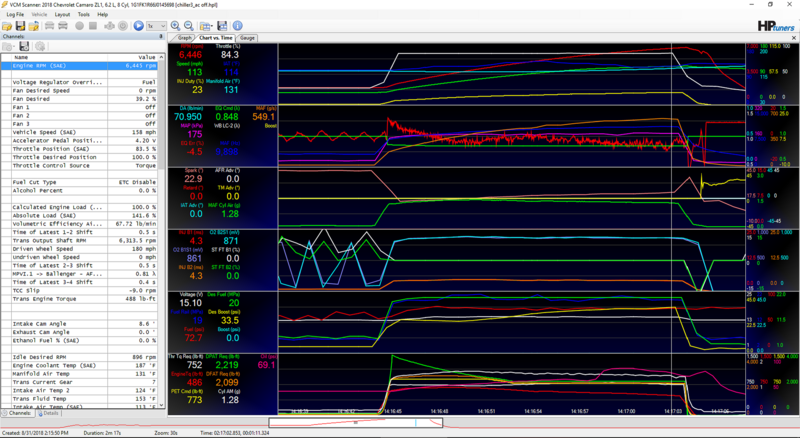 As you can see the knock is back as high as 5* with just 18* of timing on a 9% pulley! I'd love to know if you road course guys are logging KR, especially if you're modded. Dyno Pul #4 at 2:47PM - the car sat on the dyno with the fans on it and the MAT seems to somewhat settle into this 17X* area as the previous pull was only 8 minutes previous and the temps are only a little hotter than run 3 starting out, but still a timing killer at that heat range, despite again the Engine coolant, IAT1, and IAT2 ALL still being reasonable, and don't forget again, the MAT aka Manifold Air Temp is what our power is based on. Knock spike is still there at 5600 RPM at nearly 5* with just a 9% pulley with less than 19* of timing. Dyno Pul #5 at 2:53PM - the car sat on the dyno with the fans on it and the entire system was even MORE heat soaked in just 6 minutes after just a NINE SECOND PULL and the MAT was pissed off now LOL, despite the Engine coolant, IAT1, and IAT2 ALL still being reasonable, and don't forget again, the MAT aka Manifold Air Temp is what our power is based on. MAT 163* - and as you can see, the knock is aggressive again with just 13 PSI and less than 18* of timing! Up next, we went to the 15% pulley, which is a very common upgrade on the LT4s, but without cooling there were very little gains between the 9% and 15% pulley, even with the addition of headers, simply due to the hot Manifold Air Temps. We could not get any timing into the calibration because of the heat, just like the 9% pulley... more fuel, less timing, SOI tweaking, nothing seemed to help... until we added the CHILLER! So, what you can see is the Manifold Air Temps aka MAT will actually go DOWN once it's hot on the 9% pulley, and you can clearly see the IAT2s are very close to the IAT1s the entire time and never got over 120*. But, beyond the cold pull, the MAT are just insane and every SINGLE pull beyond the first cold pull was over the first threshold for timing pulling with the stock calibration, and you can remove this, but do so, and you're seeing a lot of knock in the upper RPM band. On this ZL1 looking at logs, you will see. 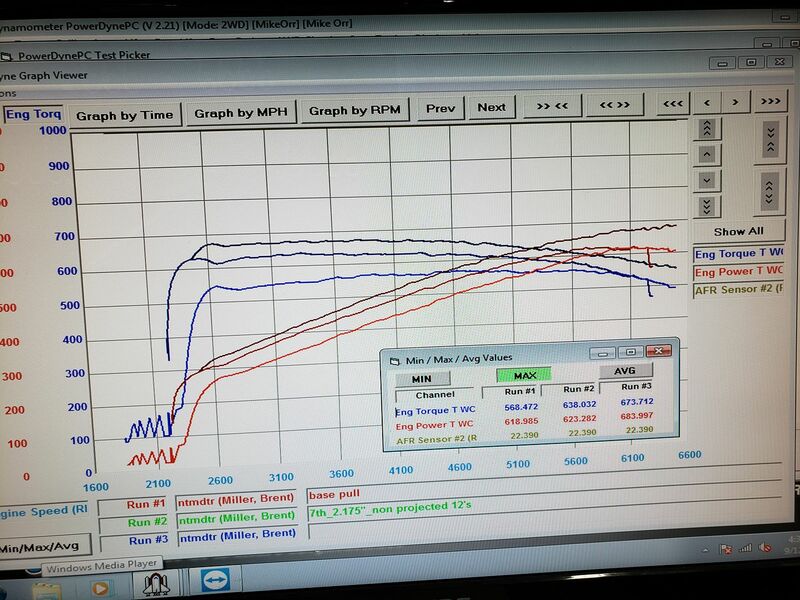 With the 2.175 upper pulley with headers makes a peak of 13.4 PSI of boost so we gained and lost some with headers. The MAT started hot on this pull despite letting the engine cool off from some previous pulls with this combo, dialing it in. I'll skip those for this since the previous group showed the drastic jumps in Manifold Air Temps from run to run and just focus on the amazing chiller results. MAT 151* and just 16 seconds later were up to 168*!!! - This 15% combo causes the MAT to keep heating up more and more and again this combo would knock regardless of adding more fuel and pulling some timing until it wasn't worth the upgrade. MAT 112* - LOOK AT ALL PREVIOUS RUNS, NEVER DID IT GO DOWN WHEN IT WAS UNDER 140*! MAT 124* - This was 27* colder than the previous pull with the stock heat exchangers, despite removing the side cooler for the chiller. NOTICE LESS BOOST AND 4* MORE TIMING resulting in 61 wheel HP more! So looking at this, the stock heat exchanger system can stave off an increase in manifold air with just a 9% pulley but it will still show knock; however, a 15% pulley cannot stave off the increased manifold air temps and that is why we have the Triple X Heat Exchangers in the X800 package. Those have 150% more fluid and drastically improve the MATs as well as the recovery time. You guys pushing the car with the stock hx system are not getting the most out of your car's potential power! We were able to advance the timing 4* more gaining a great amount of HP putting down an extra 61 to the wheels! The IAT2s although worthless for tuning the Gen5 LTs show the true benefit were just 102 at the start of the pull, dropped down to 100, and then ended at 108* despite the IAT1s being 133* at the end as it was sucking in hot air with the hood open. That fought off over 30* of temps as it drew the air into the supercharger, then compressed it giving off even MORE heat, and then cooled it back down to nearly 100* as it entered the cylinders. This was done the same day as the other 15% pulley pulls. So, you can see the chiller can cool the fluid down and you can turn the chiller off for a WOT blast at a drag strip without losing HP down the track for a brief blast, but obviously not for a road course; however, this can also simulate on/off straight-line vs turns. Again, I am very interested to get one on a road course to find out. It's important to note our starting points, because we're not playing around in "boost" air of the fall when it's cool and low humidity. This thing is being taxed in a muggy humid shop with the heat index over 100*, the IAT1s are hot over 100* most of the time, over 90* ALL of the time, and this thing is still a rock star! To conclude, this plug and play kit gives you sub freezing water temperatures to the supercharger, giving you Boost Freezing temps in 100+ degree days making your forced induction system happy, allowing you to run more timing and make MORE repeatable power!